BlogHome » Blog » Chevron from heaven? 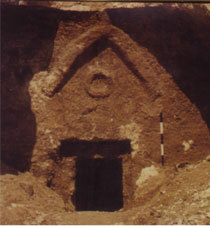 In the film “The Lost Tomb of Jesus,” one of the goals of the production team story was to find this mysterious tomb with a very special symbol above the door. The director Simcha Jacobovici and his crew, after a tremendous effort, find the wrong tomb and set out to “find” the other. The staged reenactment was very entertaining. The director himself climbs distant walls, with the actual tomb in the foreground. They stand at a distance talking to neighbors who point out the actual tomb in the camera’s foreground. The filmmakers actually knew where the tomb was all along, but it provided a great dramatic effect, right? Then they democratize the inaccessible tomb by breaking the seal on the modern cement structure which prohibited access. The director himself helps to push the heavy manhole cover away from its opening and sees the sacred emblem for the first time. And then he gasps at what he sees. SJ: Oh my goodness. No, this is definitely it. Look, there’s the chevron. It’s beautiful; it’s just gorgeous. It’s red. Look! Felix G.: Just like in the book. SJ: Just like in the book. Look at it. Felix, we found it. We actually found it. I’m going in. The chevron’s legend had evidently preceded the “rediscovery” of the Tomb. The story of the chevron and all of its implications continues to grow, in the film, in the book and on the official web site in our very day! Undoubtedly, someone is currently designing jewelry and other paraphernalia with this symbol, “even as we speak”. I would certainly buy one myself . . . . if I actually believed the story. Is this chevron story for real? If not, what is it? A free bagel and a visit to the tomb site for the first three that get it right (next time you are in Jerusalem). Sorry we won’t be able to get you access in the same way we saw it in the film!